Jerusalem designer Ori Elisar has used a bacteria-based ink to grow a Hebrew alphabet in the lab for his Living Language type experiment. The project has been created as part of Elisar's final thesis at the Bezalel Academy of Arts and Design in Israel, and is part of the designer's ongoing explorations into typography and the ways language can be expressed visually. "Using my research, experiments and results, I am hoping to question nature, culture, character and language with some new theories of my own," he said. The ink has been created using paenibacillus vortex bacteria, and is the development of a concept proposed by the designer two years ago for a biological ink that would grow and develop on paper. 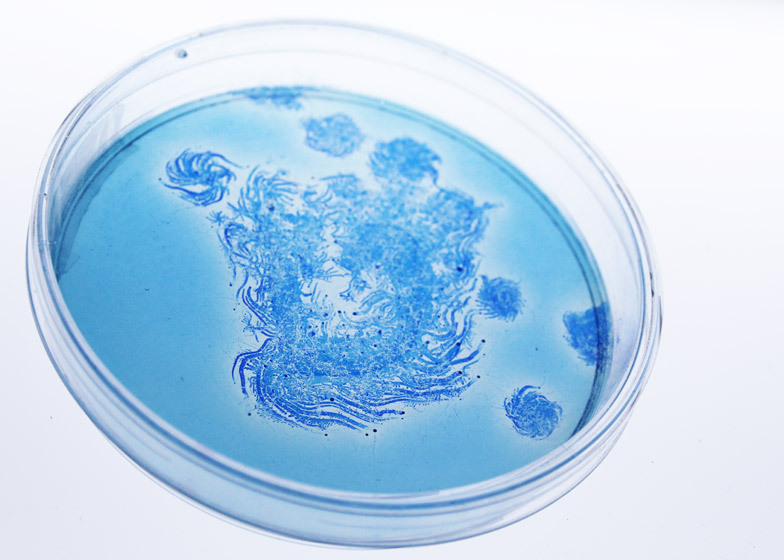 Working with Professor Eshel Ben-Jacob at Tel Aviv University, Elisar spent three months developing the initial concept into a functional ink, before taking a further two months to create the letters in petri dishes. The living letterforms blend the shapes of the ancient Palaeo-Hebrew alphabet and the modern Hebrew alphabet. The bacteria is placed in each petri dish in the shape of an ancient letter, and algal protein food added in the form of a modern letter. As the bacteria consumes the food and grows it gradually transforms into the shapes of the modern alphabet. "I tried to see if I could re-create the evolution process of the Hebrew letter, using a live organism," Elisar told Dezeen. The project was prompted by the designer's fascination with biodesign – a discipline that merges science, technology and design. "Because of the joint interests, both sides benefit and the outcomes are usually not less than breathtaking," the designer said. "Biodesign specifically allows us designers to answer visual and conceptual questions, and helps us solve design briefs using tools from the world of nature which, based on aesthetics, are hard for us to recreate." Other designers have also experimented with the possibilities of biodesign, with Berlin designer Jannis Hülsen growing a cellulose skin for a stool, and Dutch designer Jelte van Abbema printing simple typographic forms with bacteria. Although the Elisar's project isn't intended to be a functional typeface, the designer sees it as an alternative to typography's occasional perception as "the most dry and boring field of design". "This might be the reason why young designers try to reinvent the field, and use new techniques and work with exciting materials," he added. New York artist and designer Moritz Resl also aimed to push the boundaries of traditional letter shapes by compiling a ghostly typeface that overlaid each letter of the alphabet from more than 900 font families. Polish design studio Zieta turned to more solid materials, using metal-inflation technology to create a metallic alphabet that was cut and welded from paper-thin sheets of steel, before being blown up like a balloon.